Their task was the easiest. Someone else's written text was supplemented with their photos. The journalist chose the subject of the photos. Often the selector was the media outlet's chief editor. Armenian and Italian media outlets and TV channels can be placed among those in this category. These people searched for topics themselves, decided the suitability of departing for one place or another or of the degree of danger. Photographers from Russia and Armenia fell into this category. These boys knew their agencies' standards and worked within those standards. During active military operations, Reuters demonstrated the most vigor. Both its Tbilisi and Yerevan representatives were in Artsakh during the most intensive fighting. I'm writing about the period between April 2 and 5. 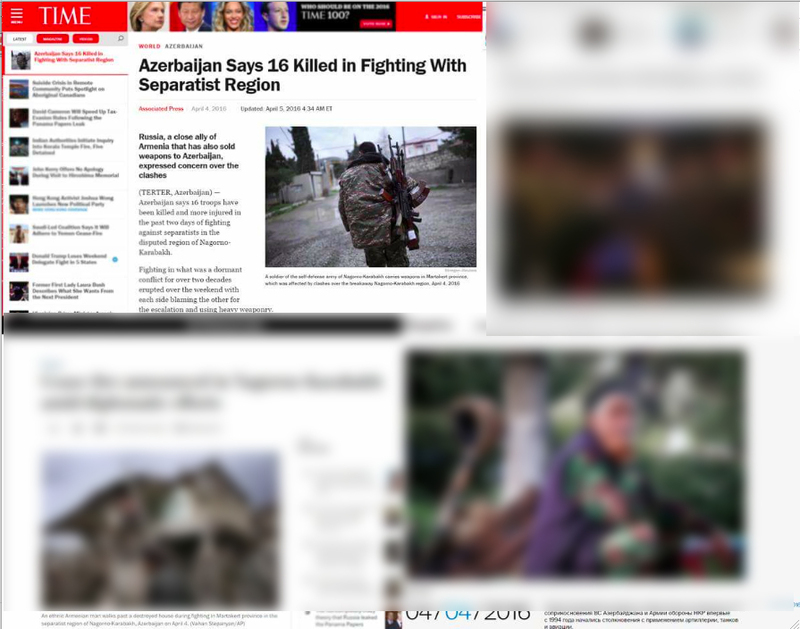 And I don't intend to mention those journalists who went to Artsakh after the verbal "ceasefire" agreement. If you've decided that it's necessary to go to the war zone, you must also understand that that departure is an "autonomous navigation" like that used in a submarine. The crew of this "vessel" must be supplemented at home — in Yerevan, and preferably, the crew doesn't vary. First of all, forget all the articles and tips of Russian and foreign photographers on how to behave on the battlefield. On those battlefields, they were in a neutral position. Even in the Chechen War, numerous Russian photographers succeeded in taking photos by introducing themselves not as a Russian photographer, but as an employee of a foreign media outlet. Artsakh's war is our war. And god forbid, we fall in the opponent's hands. You won't be saved because you're a journalist — unlike those very same Russian photographers. If you seat someone in your vehicle, you will bear the burden of responsibility of their life. And do your problems often coincide with your companion's problems? Anyone who gets to the area of military actions has to very clearly picture the purpose and problems of going to this area. I myself established my goal: to work for the Armenian press, to provide first-hand information to the citizens of Armenia — to reduce the increasing panic among the population. I particularly wanted to calm the soldiers' parents. I had clearly chosen my target audience. Do you think foreign photographers had this goal? One of the fallacies of Armenian photographers is that it seems to them that the local authorities, seeing their press badge, will start to do everything to help them. Many lived through disappointment from the defense ministry's press center's behavior. But one can also understand the employees of that department. Helping young photojournalists to select photos and providing transportation is not within the scope of their problems. Of course, organizing visits for the media was, but what photographer wants to join a multitudinous group of their colleagues? All were striving to become the sole provider of exclusive photos. All these versions are fine for peacetime. But when the guns are rumbling, you have to clarify what you're endangering your life for, taking photos beneath that roar. No photograph in the world is worth a human life — accept this as an axiom. You're taking photos so you can transfer them to Reuters or some other agency? You probably know that below your photo there will be a caption. For example, "Armenian separatists…" You can picture what comes after. The director of an Armenian agency proudly posted on his Facebook page reports from the foreign press with his agency's photos. 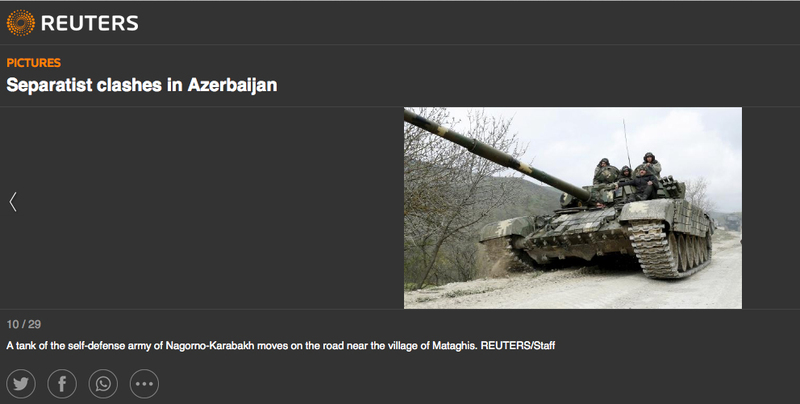 TIME magazine had "adorned" the photo with official information from Azerbaijan's defense ministry. No comment. On more than one occasion, I've refused to work with Russian journalists. Some wanted to go to Artsakh with my car and work with me; some (REN TV) asked me to provide them with photos. I turned them all down because I didn't know what caption would accompany those images. For example, a respectable Arabic TV channel asked an Armenian editor for a video where our artilleries are shooting in the opponent's direction. The request was not refused. The video was provided. Even if that Arabic TV channel doesn't accompany the video with the image of a destroyed Azerbaijani village, there's no guarantee that the video won't be resold to a third party, say, a Turkish website, that will then start an uproar of shelling unleashed against civilians. Under no circumstances should you send a semi-finished product — and in this case the "product" is the photograph. Send the complete story, which includes also the text. And demand the publisher publish your photo only with the caption you provide. During filming, you need to avoid "contact with the site". If the technique can be seen in the photos, with buildings in the background, and surrounded by mountains, it's very likely that your photos will interest the opponent. And don't tell me that everything is already filmed by satellite and unmanned aerial vehicles. Your photos will be needed by the opponent, who will save money and time this way. Sometimes I've been forced to use photo editing software, to conceal the photo's technique from the overall picture of the village. But I don't sell my photos to Reuters, so this fault of mine is excusable, since it aims to save human lives. There are many problems faced by journalists in this war. You can't find the answers alone. I think that a roundtable discussion with the participation of defense ministry representatives is necessary to avoid such unpleasant departures in the future.